Is this a book? A game? I am still not sure, but it is a lot of fun to read/play on my iPad. You are the main character in this first person mystery about a manor that has many secrets. The former eccentric owner has made it very difficult to advance through the estate, with many puzzles to solve using clues left in the text and images. Rereading has never been a more important skill. More often than not, these interviews are conducted with celebrities and other well known individuals. In a quiet surprise, Bryan is featured, as an attorney using his skills and passion to attempt at fixing the legal system. His special focus is on exonerating people from death row. Bryan also points out the corruption involved in corporate prison building and how it affects other public services such as education and health and human services. Very inspiring person. Lyn Hilt, connected educator and facilitator of PLPNetwork’s Educational Leadership in the Digital Age, shared this post with me. It was in response to my post about the benefits and limitations of Twitter when tapping into your personal learning network for knowledge and ideas. 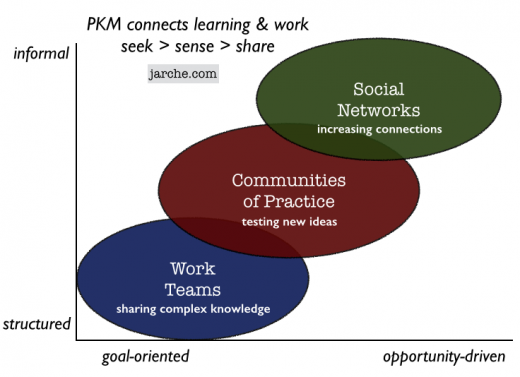 The visual framework by Jarche is an excellent way to conceptualize the learning progression someone can take to maximize their PLN to its potential. The reporter asks the question, “Is Kobe Bryant the reason for the Los Angeles Lakers downfall?” This is a pretty critical article of the superstar, but has many sources to support his argument. What I took from this piece is the impact that both a positive or negative person can have on an entire team. No one person is greater than the sum of an organization’s parts, which is why toxicity has to be removed from a school culture in order to grow. I have read it, but have not had time to develop an appropriate response. How I respond to this article probably deserves it’s own post…stay tuned!